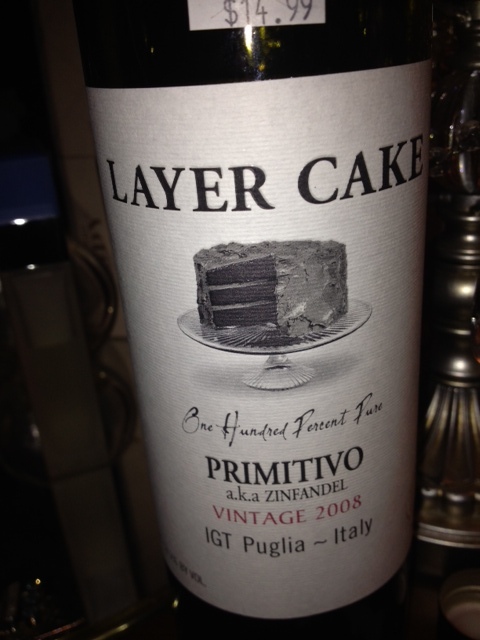 Layer Cake – Primitivo aka Zinfandel – A Forty Miles Winegasm! Saturday afternoon and The Professional and I are wine shopping. Our day was filled with down pours, strong wind gusts that resulted in a tornado touching down on Columbia Pike, Arlington, VA. 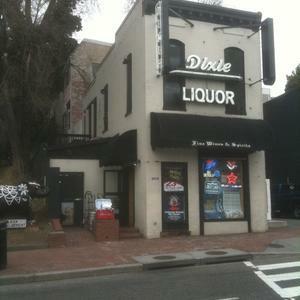 The first Living Social coupons took us to Cairo Wine and Liquor (DC Wine Guy) at Dupont Circle. I checked their website and saw that they had some of our old time favorites. We were on the hunt for CatAmongsthePigeons (Shiraz & Cab Sauv blend) and Castle Rock Pinot Noir. Umm… All I have to say is order wine online then pick-up your shipment from the store. The wine selection is very very slim. The DC Wine Guy is more like your old, crap corner store with that marvelous old DC musky smell. While I’m writing, the aroma of the Layer Cake Zinfandel is greeting me with a hello…. NOT YET. We say goodbye to the DC Wine Guy and it was raining cats, dogs and pigs (old childhood reference :)); next stop, Georgetown, Dixie Wine and Liquor. If you’re familiar with the Washington DC area, when it rains, drivers forget how to drive and everything comes to a standstill. Finally, we have arrived and are greeted with bare wine shelves. REALLY???? We scan the shelves slowly and I select an Oregon Pinot Gris and Layer Cake. The Layer Cake intrigued me, I love Zinfandel, Ridge Zin is my favorite. Plus, I never had a Zinfandel produced from Italy. I’m being overcome by the aromas; I swallow. I have to take a sip. NOT YET. I need to write. The Professional is by my side, relaxed. He’s already on his second glass of wine, grinning. I’m on my second set of TUMS. We had lunch at Lindy’s Red Lion, 17 Street N.W. Washington DC. A must visit if you want a delicious burger, flat beer and ghetto service. I know I’m digressing, but I have to share. We sat upstairs, the waitress yelled from downstairs “You okay over there.” We look at each other puzzled, silence… no words were spoken. I could tell we shared the same thoughts “she can’t be talking to us.” WRONG! She finally approached the table and repeated her question in a manner “Didn’t you hear me the first time.” WOWZER!! Okay, time for the tasting. Before you sip, you have to sniff; it’s difficult for me to sip wine without sniffing. 🙂 There are aromas of cocoa, berries and spice (intoxicating). OH….MY…GOD!!!! I don’t mean GOODNESS!!! This is friggin delicious! Full-bodied, fruit forward, cherry flavors. My mouth is exploding! I just got chills. (Oh, I think it’s from the fan blowing, hot flashes 🙂. The Professional just graced me with a smile and agreed, “This is good wine”. Second sip, there’s a slight, slight hint of sweetness up front then it goes dry, JUST ORGASMIC! Yes, I said it :). Third sip, I’m picking up aromas of black licorice. This amazing wine is playing tricks on the senses. LOVE IT! Layer Cake Primitivo aka Zinfandel was worth the 40 miles journey to the little wine shop called Dixie Wine and Liquor.